When the general public thinks of a pink Cadillac, minds instantly flock to a 1959 model with gorgeous tailfins and sweeping lines. But, the fact of the matter is Cadillac never made a pink 1959 Cadillac. The myth-debunking comes from DriveTribe, via Diego Rosenberg. The author articulately combed through years of Cadillac factory colors to show 1956 was, indeed, the only year General Motors’ luxury division offered a rose-colored exterior hue. The pink Cadillac myth often stems from Elvis Presley, who owned such a car. But, Elvis’ car is actually a 1955 model that was repainted from blue to pink. Our collective minds have simply associated the nostalgia with the 1959 model year. Arguably, 1959 was a pinnacle year for Cadillac and “rocket age” design trends. 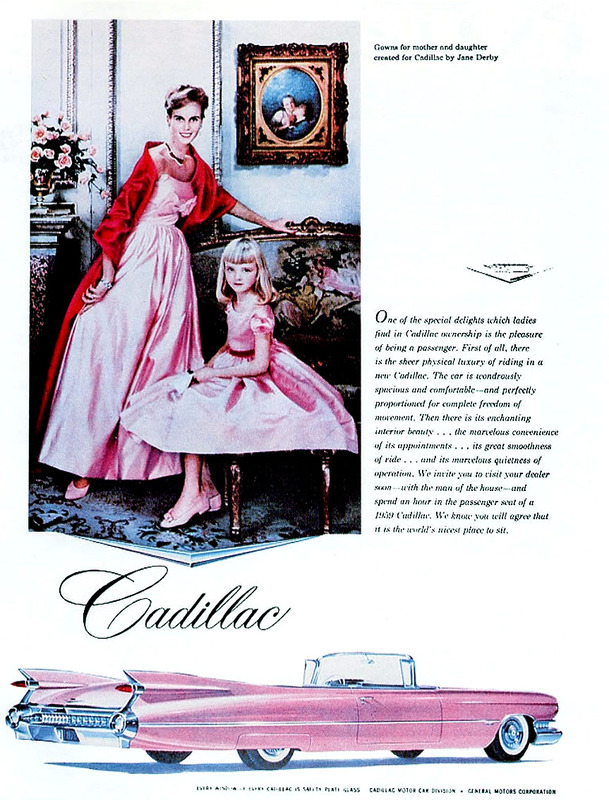 Posters and associated media still exist today depicting a 1959 Cadillac finished in pink. The fact hasn’t stopped some from depicting the exact car, but know Cadillac never actually offered such a color for one of its staple 1959 models. I think they did offer a ‘Shell Pink’ version a few years later – Ali (then Cassius Clay) had one. GM might not have called it ‘shell pink’. But in the late 50s/early 60s, Fender guitars (wanting to be the guitar Standard of the World) sourced most of their custom colors from DuPont’s Cadillac color catalogue. Fender sourced Cadillac’s best colors for their ‘custom’ line – Lake Placid Blue, etc. A good, custom color 50s/60s Stratocaster is $45-50k. Way more, if owned by a luminary. Ok – sorry for boring you, but back in the day Cadillac colors only made great guitars even more special. This is the kind of rich history I wish Cadillac would capitalize on. In some way or another… Cadillac used to mean world’s best. It still does, but few would say modern Cadillac is “the Cadillac of automakers”. … the idea was: for SXSW in Austin, do an exhibit linking Cadillac’s effect on 60 years of music and culture – then offer maybe 10 Escalades of Hendrix Olympic White, Jack White’s Daphne Blue, Cobain’s Fiesta Red, etc … strictly limited edition, 10 (or less of each). It’s a better connection with Cadillac’s effect on music & culture than, say, the other SXSW co-opters (Doritos? ); so have Austin homie Gary Clark Jr (yes, he’s young) play his Olympic White. Austin’s a huge music town, lots of social media influencers, a cool exhibit, and, eventually, have 6-7 Escalades in the coolest Cad/Fender famous colors – only 10 of each, maybe less. Sell them, sell them for charitable endeavors, or just gift them. Johan thought it was a cool idea. But he emailed me back and his ‘team’ (hi, Melody and Uwe) didn’t aspire to it. Coffee, copters to the Hamptons, Cadillac House – not sure if they didn’t get it, or it fell victim to the not-invented-here syndrome. But Johan got it – timeless, not dated. I’m not an old guy hanging onto the 60’s – I just see a cool connection that an audience of influencers @ SXSW would think was cool and spread the word. Ok – I’m done. Sorry again … TMI. “We invite you to visit your dealer — with the man of the house — and spend an hour in the passenger seat of a 1959 Cadillac”. And not the driver’s seat but the passenger seat should be “the world’s nicest place to sit” for a woman. Rosie the riveter must have been court-martialled, for such garbage to appear. Woodrose Poly looks pretty pink to me… a standard 1959 Caddy color. Read the original article and you’ll understand my point – the hallowed 1959 “Pink Cadillac” is pretty much a creation of popular culture. Thanks to Sean for writing about it! Cadillac would paint cars any color you wanted from any available color for the three previous model years. Cadillac used “Mountain Laurel” as their pink color and therefore you could get a 1959 Cadillac in a color used in 1956 and 1957. “Woulda, coulda” doesn’t count, sorry to day. I owned a “Coral” 59 Cadillac Sedan Deville and it damn sure looked “pink”……. Gas guzzling ugly cars like this with wobbly suspension created the bad image which hampers Cadillac all over the world. That’s why the South African had to go. Observer7, this item on Cadillac history disputes your assessment of Cadillac in the 1950’s. Sean, Cadillac most certainly DID make a pink 1959 Cadillac…I owned one! I bought this beauty from the original owner; an older gentleman. That when I was in my late teens (and yes I loved “Caddys” even back then). It was not a particularly pretty pink; I would describe it as a dusty rose color but, what a beauty…I wish a thousand times over that I had never sold it. my granddad has a pink 59 cadillac so they did make pink cadillac.